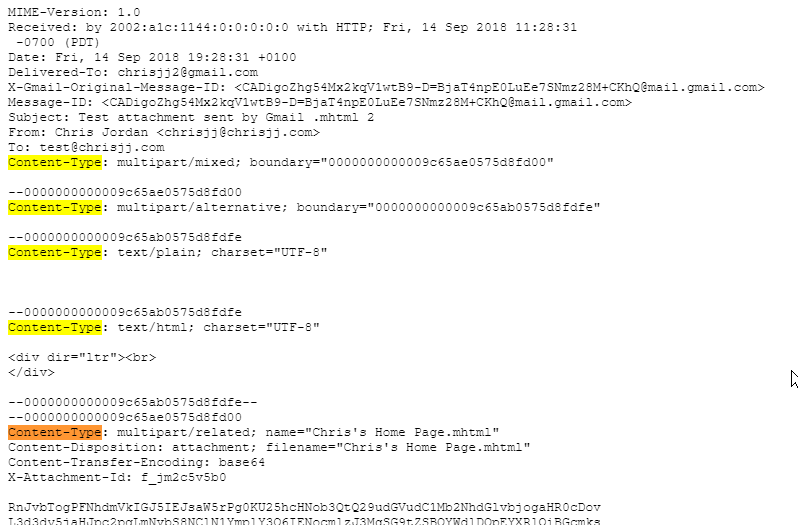 Anyone else seeing failure of FM client to detect an .MHTML attachment from Gmail? But Fastmail pretends there is no attachment https://i.imgur.com/cA5rATu.png . In Chrome and Firefox. This is a rather serious misrep of the message content by Fastmail. ".mht" and ".mhtml" attachments are treated in different ways by various email systems. This seems to produce an empty display (either previewed in the Fastmail web interface or downloaded and viewed in Internet Explorer). These can be downloaded and viewed correctly using Internet Explorer from either the Fastmail or Gmail web interface. Fastmail to Fastmail produces a proper sized attachment which can be previewed properly using the Fastmail web interface (see screen image capture here) but which is displayed improperly when downloaded and viewed in Internet Explorer. These can't be previewed (Gmail limitation) but can be downloaded and displayed properly in Internet Explorer. So unless you use a zip or similar container I think you can't depend on .mht or .mhtml attachments getting properly through email transfer. The problem I'm reporting here is Fastmail pretends there is no attachment. It shows no attachment thumbnail. Still I'd be interested to hear if anyone else gets this. My point is that Outlook.com to Fastmail works fine. It’s the Gmail outbound that seems to create an odd message format which can’t be read by Fastmail or Outlook.com. I sent a message from Gmail with To addresses at Fastmail and Outlook.com (one message with two recipients) and they were both received in a way which I think indicates that they were not properly parsed. Each receiving system interpreted the Gmail MHT attachment differently and neither was correct. It’s a Microsoft format, I think. How are you creating your MHT file? Are you using the Gmail web interface to send it or a SMTP client? It’s the Gmail outbound that seems to create an odd message format which can’t be read by Fastmail or Outlook.com. Understood. But I'm not seeing that. I'm not seeing anything odd about the Gmail message as sent. In particular I'm not seeing /rfc822. The problem is the Content-Type in the MIME block encapsulation and the MIME formatting. Look for the Content-Type header down at the start of the MIME block, not in the main contiguous header list before the first blank line. How are you creating your MHT file? Are you using the Gmail web interface to send it or a SMTP client?